Castle Mountain is one of those classic Banff National Park highway jaunts that you just can’t resist. It’s often overlooked but when the conditions are right you can capture some gorgeous alpenglow for both sunset and sunrise. 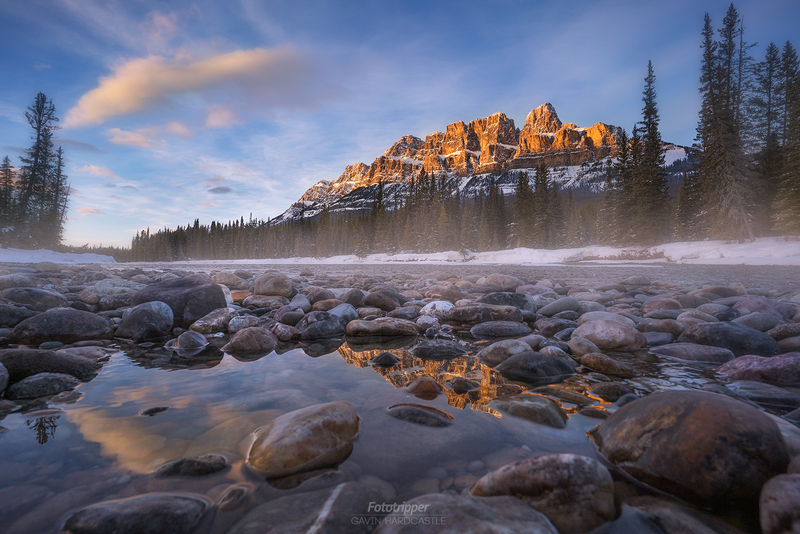 I was actually on my way to Emerald Lake for a blue hour shoot when I noticed the peak light on Castle Mountain showing a promise of rich colour. A quick scramble down to the river shore yielded some nice reflecting pools hidden in the river rock but the only way to get the right angle was to ditch the tripod. I had to shoot this hand held so that meant I had to open up the aperture to its widest, fastest opening of f/2.8 so that I could shoot a short exposure. I knew the foreground rocks would be blurred with some nice bokeh so I focused on the glowing mountain peak, held as steady as I could and rattled off a bunch of exposures. A quick check in the viewfinder told me I was getting blurred images so I switched on the image stabilization that’s built into the sensor on the A7RII and I was golden. I got sharp. hand held shots with the bottom of the camera actually sitting in the water. That flip screen was worth it’s weight in gold that night.